The 8 Quart Dishpan is ideal for a variety of basic household needs. It's small compact option is ideal for smaller kitchens or camping where space might be limited. It is designed with a rectangular shape and a modern design that is easy to clean. 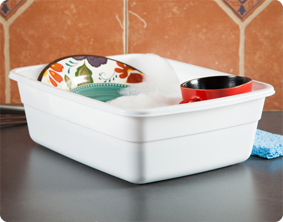 The dishpan fits comfortably in single or twin sinks and allows you to expand your space with more washing and soaking room. Two handles are molded into the side for comfortable and easy lifting and transporting. The plastic, non-porous container is durable and useful for many household tasks such as soaking dishes, washing small toys, cleaning delicate clothing and storing items in a cabinet or pantry. The overall dimensions of this item are 14" L x 10 3/4" W x 4 1/2" H.
Overall Assembled Size: 14" x 10 3/4" x 4 1/2"
The 8 Quart Dishpan is ideal for small kitchens. 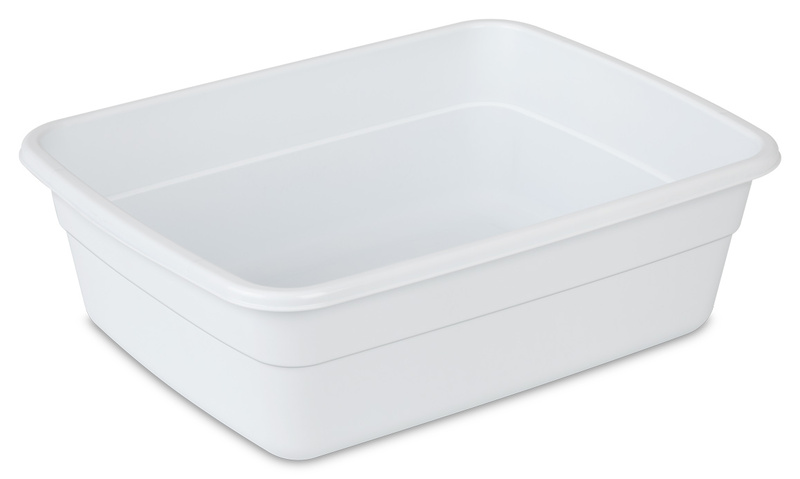 8 Quart Dishpan is rated 3.0 out of 5 by 2. Rated 2 out of 5 by Gj31 from This product is good for a single person who lives alone. I received this product in exchange for my review.The 8 qt.dishpan was too small for my family of three-yet it did hold a good amount of dishes-the problem was when I would actually wash the dishes I felt like I did not have alot of room.If I had brought this dishpan myself I would of brought the 12 or 18 qt one,that is more to my family's liking.I would recommend it to a single person though,one person's dishes would fit in well. Rated 4 out of 5 by Lesakisses from Sturdier than your average product I received this product in exchange for my review. I use these for not only storing items but also for holding soapy water for car washing and rinsing off rocks after being polished. This one seems to be sturdier than most of my other ones that always cracked either on the bottom or the handles. It is a more flexible plastic and does not look like it will ever crack under normal use, it is also a softer plastic than most I have used in the past. The handles do not cut into your hand like a hard plastic container when picking it up especially if it is full of a liquid and does not bend crooked like some do when holding with liquid in it. I would recommend this product over others that would not last as long.